I’m certainly no plant expert and I’m still trying to determine if I actually have a green thumb or not, but I do love a bit of botanical styling and I employ this in both my interiors and flatlays alike. Unlike fresh cut flowers, plants are the props that keep on giving so they are a fabulous and rewarding [not to mention healthy] addition to your home and styling pantry. And they don’t actually require as much care as you might think. I keep a lot of my indoor plants on the window sills by my kitchen sink and in the bathroom...both sills receive really good filtered, natural light and both spots are also good reminders for watering. A lot of my indoor plants like the popular Fiddle-leaf Fig, Rubber Plant and Devils Ivy only require a good shower [literally!] every other week. I have been known to overwater my string of pearls and chain of hearts...they like to completely dry out between waterings so don’t shower them with as much watering love as you want to. These cascading plants make the perfect green props for shelfies and vignettes as well as trailing through a flatlay. Vignette using prints from @TheLovelyOther, candle from @Milkies.Candle.Co and my String of Pearls. Tip: It’s also a good idea to give the leaves of your indoor plants like Mr Fiddle a bit of a polish before you style and photograph them...just like your inanimate props, plants collect dust too. Flatlay using Israeli Ruscus Leaves with timber jewellery from @OneHappyLeaf. But obviously, green styling doesn’t have to be all about the living plants. 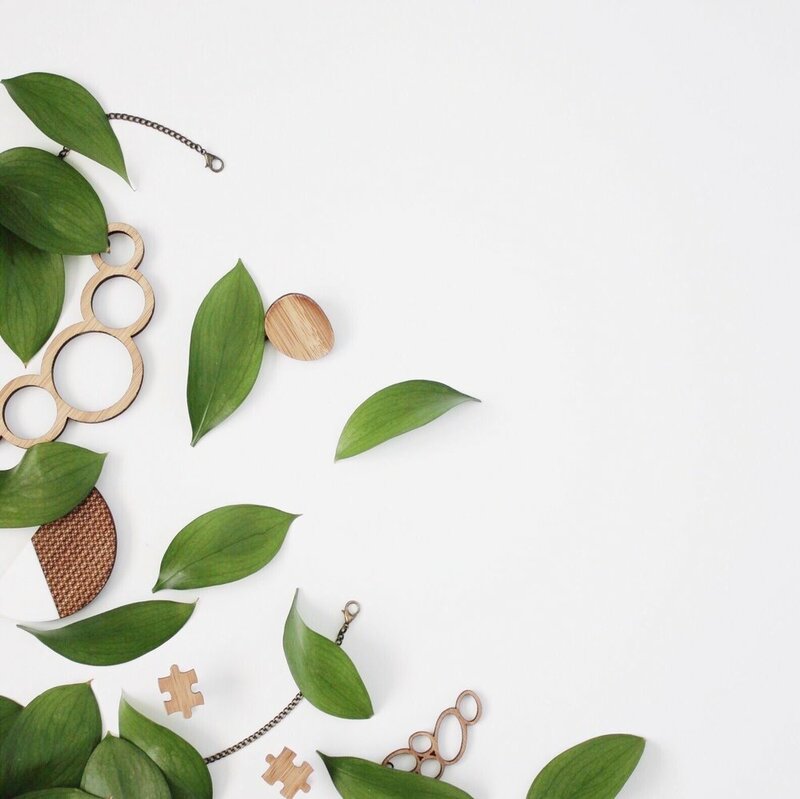 Along with flowers, I often use leaves in my flatlays. Monstera leaves and Israeli Ruscus leaves are my favourites...they both last for ages in a vase of water so you don’t have to use them straight away and look fab even when you aren’t styling with them. I have been know to sacrifice the occasional succulent or two in the name of styling too. Flatlay using paint swatches and succulents as props. Props such as wooden leaves or paper leaves, books and paint swatches from hardware stores can also add that botanical feel. And of course green inspired prints like the range from The Lovely Other don’t require any green thumbs whatsoever and give that fresh green pop minus the maintenance and responsibility. Flatlay using prints from @TheLovelyOther as well as paint swatches, succulents and timber monstera leaf from @_zilvi. I’m looking forward to seeing your take on plant styling for this week’s botanical theme with our fabulous sponsor Cindy, the talented creative behind @TheLovelyOther...it’s going to be a goodie!